Cooling firm GELID enters the computer chassis market with DarkForce, an all-black midi-tower with support for up to eight fans (two included), support for graphics cards of up to 410mm, a top I/O panel with HDD/SSD docking station, and a large side window. The GELID DarkForce has a MSRP of $119.99 (91EUR). As thermal specialist GELID Solutions certainly offers solid cooling options for this case and provides locations for up to 8 fans. Two silent 120mm fans (rear and front) come preinstalled with the case. The case even enables to mount a 80mm or 120mm fan with a max. 15mm thickness onto the side panel. 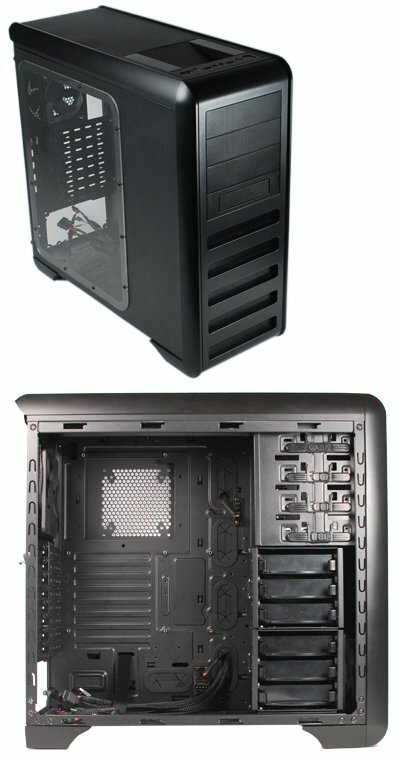 The DarkForce supports a 120mm or 240mm radiator at the bottom of the case and offers 8+1 slots for extra connection of peripheral devices. Next to the USB 3.0, two USB 2.0 and an eSATA port a top I/O with bay for a hotswap 3.5" or 2.5" hard disk or SSD is built in at the top of the case for easier connecting or cloning of hard drives. A 5.25" to 3.5" drive bay converter for any optional 3.5” device is included in the package. The case features an extra large transparent acrylic side panel which enables the best view of the exclusive components inside the case. Then the DarkForce includes 6 individual HDD trays and a HDD cage which can be removed when using an extra-long VGA cards (up to 410mm) and the case offers enough space for large size CPU coolers (up to 165mm height) as well. The entire case design is based on a tool free optical drive mounting concept and includes 2 internal fan extension PCB’s. On the base of the case a dust filter is built in to prevent any dust coming from the floor. Most of the cables are sleeved in black to provide a fully black case and to keep all cables organized. “No compromises were made in the design of this case, no costs were cut in order to provide PC enthusiasts looking to upgrade or replace their desktops with a high quality build“, said Gebhard Scherrer, Sales Director of GELID Solutions Ltd. The “DarkForce” is RoHS and WEEE conform and carries a 2-year warranty. The “DarkForce” PC case is available now and has a MSRP of USD 119.99 or Euro 91.